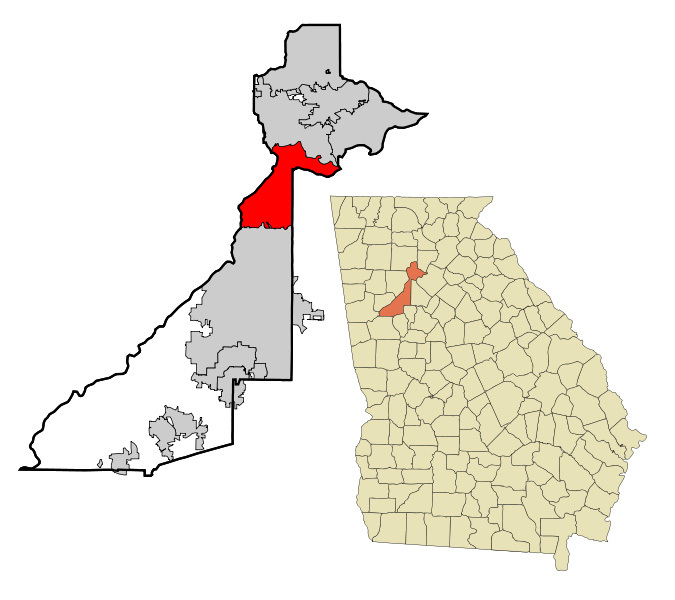 Highlighted areas are: orange is Fulton County within Georgia; then in red is Sandy Springs within Fulton co.
A mayor and six city council members were elected in early November 2005. Eva Galambos, who – close to 30 years earlier - had initiated and led the charge for incorporation, was elected mayor by a wide margin. Formal incorporation occurred on December 1st of that same year. In 2010, the city became the first jurisdiction in Georgia to successfully "bail out" from the preclearance requirements of Section 5 of the Voting Rights Act. Sandy Springs has always had a “good vibe” to attract business to its fold. Even before it became a city Fortune 500 companies were attracted to the area – the most notable perhaps is UPS that has its headquarters here. Saint Joseph’s Hospital of Atlanta is a 410-bed and 750 physicians strong – it is recognized as one of the leading medical center in the southeast for many specialties. St. Joseph’s is also among the few hospitals around the world to receive Magnet Recognition for Nursing Excellence. Scottish Rite Hospital has long been recognized as one of leading medical facilities for children and teens. Its recognition spreads ways beyond the city and the state - Children's reputation is indeed ranked among the best in the nation. In The Movies – Sandy Springs has been location to many movies, TV shows (or some parts of it): “Coma,” “Unnecessary Roughness,” “Vampire Diaries,” and “The Three Stooges” are but a few with features and shows that you might have seen some Sandy Springs footage. The Sandy Springs Farmers Market is an open air market where friends and neighbors gather to share the experience a sense of community. Open Every Saturday morning - between mid April and October 27th - 8:30 till noon - some 50 vendors, musicians, and local residents gather for a friendly shopping experience of locally and naturally grown produce, pasture-raised meat, farm fresh eggs, and all kinds of specialty food items. Location: Sandy Springs Farmer's Market gather on the parking lot of the former Target store on the corner of Johnson Ferry an Sandy Springs circle - a short block from Roswell Rd.